The US authorities have returned the Horiuchi Sarcophagus to Italy [press release]. HSI New York returned six objects Wednesday including “sleeping beauty,” an ancient Roman marble sarcophagus lid of Sleeping Ariadne, which was smuggled out of Italy. TPC identified the object as part of a collection of suspected looted Italian antiquities belonging to a known trafficker who was involved in trafficking archeological items from clandestine excavation sites in Italy. 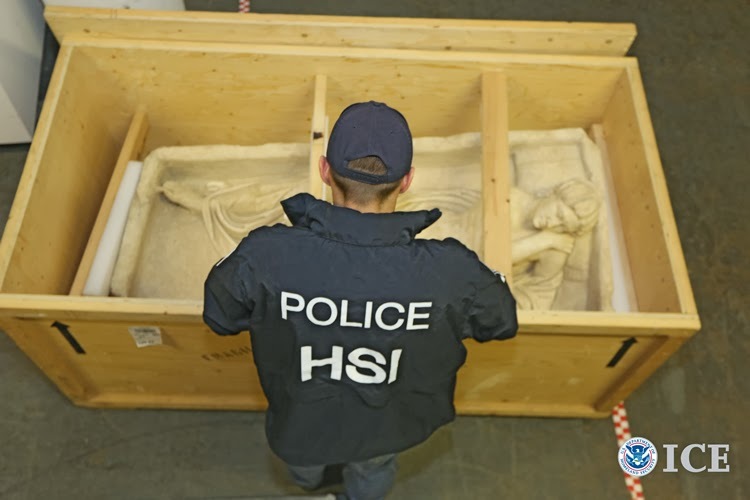 HSI special agents seized the sarcophagus lid with a warrant issued by the U.S. Attorney’s Office for the Eastern District of New York. It is not clear which 'known trafficker' is alluded to in the statement as the lid has been linked to several individuals. This is a further example of the co-operation between the US and Italian authorities as a result of the MOU between the two countries.